Sit-ins at congressional offices were just the beginning. No doubt you’ve heard about the climate action plan called the Green New Deal, a proposal that has a catchy name but has been short on specifics. No matter: You’re going to be hearing a lot more about it in the months to come. And it’s not a moment too soon. 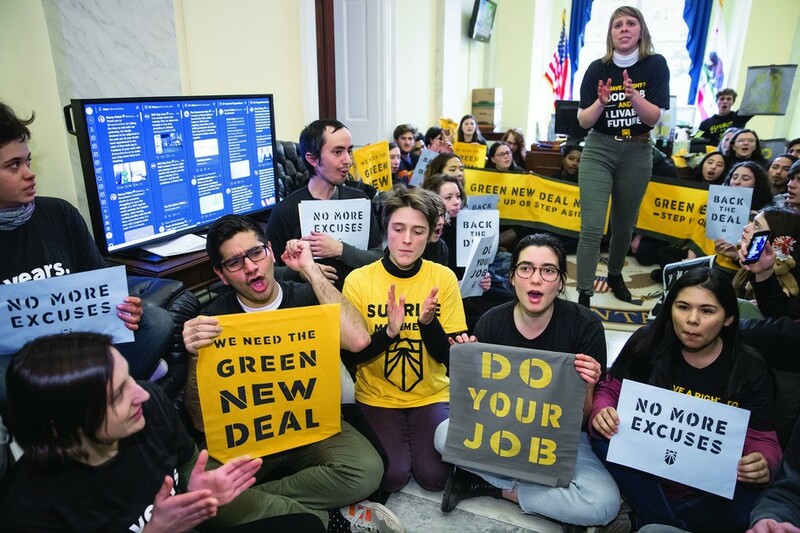 The Sunrise Movement , which led simultaneous sit-ins in Congress in November, including one at the office of incoming House Speaker Nancy Pelosi, is leading the way to establish a radical, forward-thinking action plan to save the world from the growing threat of climate change. More than anything else, the group is demanding that lawmakers take action. A rapid break from fossil fuels. A country fully powered by renewable energy in 10 years’ time. A nationwide energy-efficient smart grid, powered by clean energy start-ups that will provide good-paying jobs. Massive investment in the drawdown and capture of greenhouse gases. Diversification of local and regional economies, with a particular focus on communities such as coal mining areas where fossil fuel industries control the labor market. Even more encompassing are these ideas that make the Green New Deal a jobs bill: “Ocasio-Cortez also proposes providing all Americans with the opportunity, training, and education to be a full and equal participant in the country’s clean energy transition; universal health care programs that would help green energy start-ups get off the ground; and a jobs guarantee program that would assure a living-wage job to every person who wants one,” says the Sierra Club story. But if you don’t try, nothing happens. You’ve got to start somewhere. The planet isn’t giving us any choice. In the House, Ocasio-Cortez is leading the movement to turn a plan that is still in its infancy into a reality. Already, 40 Democratic lawmakers are on board with the idea of establishing a special 15-member Select Committee for a Green New Deal, and the number keeps growing. More than 200 local and national organizations are adding their voices, their support, and their funding to the Sunrise Movement. The idea is for the Select Committee, which would have Republican as well as Democratic members, to write specific legislation, a process that could take a few years but could serve as a major influence as the country nears the 2020 presidential election. “A Green New Deal is both smart politics and smart policy, not to mention the only practical way at this late date to preserve a livable planet for our children,” wrote Katrina vanden Heuvel, editor of The Nation, in a column in The Washington Post. And she identifies another message, too. How refreshing it is to hear environmental champions saying “yes!” to ideas. Too often, the green message has been negative — don’t build that pipeline, don’t hurt that critter — without offering a corresponding positive vision, thus feeding the perception that environmentalism is for elites who can afford to sacrifice. By contrast, a Green New Deal is shrewdly packaged, leaves little doubt about its purpose. Is there public appetite in the United States for a plan as radical as a Green New Deal? Actually, yes, there is. We understand that Democrats can’t pass legislation with a climate-denying White House and GOP-controlled Senate. But they can lay the groundwork now, by developing a plan for a Green New Deal and taking the No Fossil Fuel Money pledge. The same young people that mobilized a historic midterm turnout are now looking ahead to 2020. We will knock on doors, pressure representatives, and primary Democrats who take fossil-fuel money. We will protest and risk arrest if we must, and as we already have, to ensure this economic transformation occurs within the next 12 years. Our generation has a right to good jobs and a livable future. The Green New Deal is a winning plan for both. Now the only question is: will the Democrats embrace it? Local chapters, or hubs, of the Sunrise Movement are starting all over the country. At this point, while many hubs (not all) are on the East and West Coasts, they are slowly making their way inward. Interested parties can search for a group nearest to where they live. It’s not just the House—some likely 2020 presidential candidates from the Senate, such as Bernie Sanders and Cory Booker, also support the aims of the Green New Deal. As the 2020 Democratic presidential field takes shape, I’ll be looking for candidates who aren’t afraid to call for serious climate action and are willing to place it front and center, with specific proposals. There are myriad issues that deserve attention in the next election: health care, gun violence, and voting rights, just to name a few. But cutting greenhouse gas emissions and taking significant climate action are the solutions that will mean a livable future for all of us. Originally posted on Daily Kos on Dec. 23, 2018.